The Institute of Language & Phonology: Research Division is a private organization founded in 1976 by Arthur J. Compton, Ph.d. to conduct research and provide speech and language communication services to children and adults. The research programs of the Institute of Language & Phonology: RD focus primarily upon discovering practical linguistic solutions to enhance the communication skills of children and adults, mainly in the areas of teaching and testing materials development. The P-ESL program begins where conventional English as a Second Language (ESL) courses end. 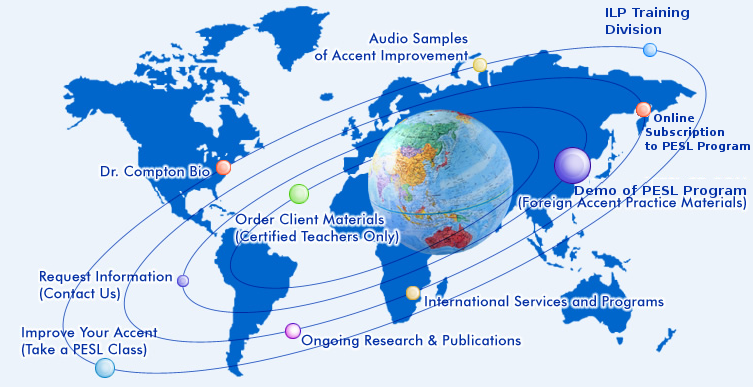 All courses are completely customized to your specific accent “habit” patterns and pronunciation proficiency level. At the end of your course, you can expect at least a 50% reduction of your accent. To hear Audio samples of improvement, click here. To try out the online practice materials, click here.